Raised beds let you control the quality of the soil and prolong the growing season by warming up early in spring and staying warm late into fall. You can make raised flower beds by piling up soil, or by build low walls using basic DIY skills. Gardening in raised beds is helpful for people with bad backs and other mobility problems, and the soil is never walked on, so it doesn't become compacted. Use the raised beds for annual or perennial flowers. Growing flowers in raised beds allows you to see and smell them close up. One of the simplest ways to create a raised flower bed is to pile up soil onto an existing bed. If your garden soil is sandy or clay, mix it with an equal amount of compost, well-rotted manure or other fine organic matter before spreading it on the bed. Loosen the existing bed's soil with a garden fork, and spread more soil on top to the desired height. Most plant roots need soil 6 to 12 inches deep, and the bed should be no more than 4 feet wide so that you can reach into the middle to tend to the plants. Without walls to contain the piled-up soil, the flower bed is at risk of flattening over time when heavy rain washes soil down the sides. Grow perennial flowers because their roots help hold the soil in place, and spread a 2- to 3-inch layer of mulch, avoiding the plant stems, to protect the soil from heavy rain. A raised flower bed made of timber has a rustic look. Redwood and cedar wood are naturally rot-resistant. Pressure-treated lumber bought after 2004 is safe to use, and creosote-treated wood, such as railroad ties, is safe if the creosote is no longer oozing and you can't smell it. If you're worried about chemicals from treated wood harming your flowers, line the inner walls of the raised bed with heavy plastic. To prepare the site, mow or cut down any grass or weeds, and break up the soil surface with a garden fork or spade. Place lengths of timber at the bed edges to the desired height, and arrange them in a staggered pattern at the corners to give added strength. Drill holes through the timber layers vertically every 4 feet, and 6 to 8 inches away from the corners. Hammer pieces of rebar through the holes and into the ground below to hold the timber walls in place. 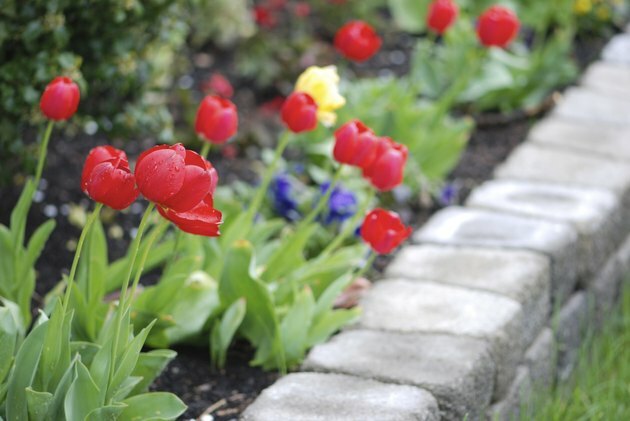 Brick, stone and other hardscaping materials create long-lasting, stylish raised flower beds. Brick and stone walls 1 to 2 feet tall around a raised bed don't require special ground preparation or mortar. To build brick walls, create a flat foundation for the walls by filling in hollows or removing soil from raised areas. Check the foundation is flat using a builder's level. Place the bricks to create the lowest layer of the wall, and place the bricks for the second layer in a staggered pattern, so each brick lies across a joint between two bricks below. For natural stone raised bed walls, a perfectly level surface is less important but the ground should be fairly level. Stack the stones so they fit closely. Take time to ensure a secure, firm fit. Build brick and stone raised bed walls to the desired height, but no taller than 2 feet. Double digging is optional when building raised flower beds, but it provides a deep, rich growing zone for plant roots. Remove the soil in the raised bed area to the depth of your spade's blade, and place the soil on a tarpaulin or similar sheet to reduce mess. The soil at the base of the bed will probably be subsoil, which is a different color and texture than topsoil. Break up the all the subsoil by pushing a garden fork into it, and levering up the fork. Mix the removed topsoil with an equal amount of fine organic matter, such as peat moss or compost, and return the topsoil to the bed, before building the walls for the raised beds.